When you acquire a tactical flashlight it’s assumed that at some point you’ll need to wield it either to help extricate yourself from an emergency situation or to ward off an attacker – be it human or animal. As such it behooves you to know how to deploy the tactical flashlight in the most efficient and effective manner when the time comes. Below we’re going to layout the most desirable characteristics of a tactical flashlight along with how to use it effectively for survival or defensive purposes. Not all tactical flashlights are created equal so it’s important to know which characteristics make for the most effective ones. While every manufacturer will make a case for their flashlight being the best the fact is tactical effectiveness is quantifiable and when placed under the microscope not all flashlights pass tactical muster. Here’s what to look for when you’re buying a tactical flashlight. 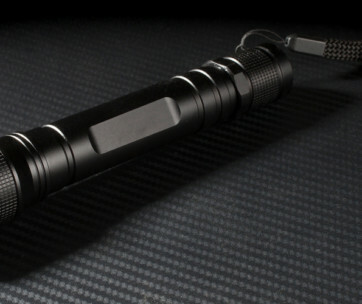 Size – What makes a flashlight tactical is your ability to deploy it quickly and effectively. If it’s big and bulky and doesn’t store easily in your pocket or on your belt it’s useless in a tactical sense. So size matters; except in this case small is beautiful. Your flashlight should fit comfortably in the palm of your hand. 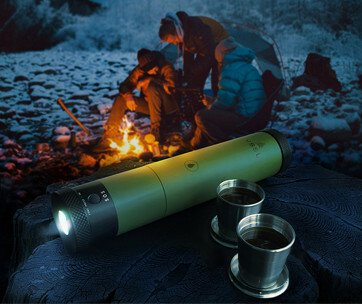 Lumens – Another thing that makes a flashlight truly tactical is the piercing, disorienting nature of the beam it projects. Standard flashlights fail from a tactical standpoint because of their weak, unfocused beams. 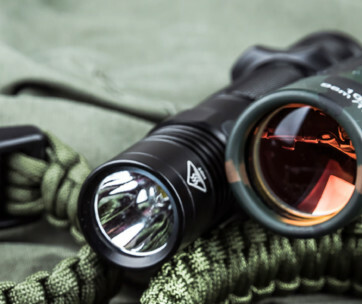 For a flashlight to be considered tactically effective it should produce at least 120 lumens. Comfort – A tactical flashlight is effective at least in part because you can hold it comfortably regardless of whether you’re just trying to find candles in a blackout or using it to crush the cheekbone of a would-be assailant. If the flashlight is unwieldy it can’t be considered truly tactical, regardless of how many bells and whistles it possesses. Simplicity – Speaking of bells and whistles, if the flashlight is too laden with features it can lead to confusion in an emergency situation. And that’s the last thing you want. So a true tactical flashlight is light on features and simple in concept and execution. 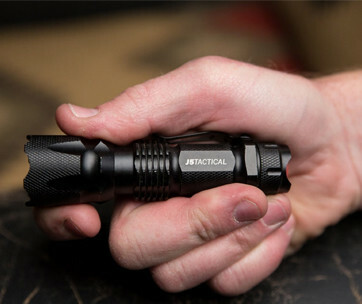 LED – Incandescent bulbs have no place in a tactical flashlight. They break easy, fail often and don’t produce the kind of blinding light you need to foil an attack. Therefore the tactical flashlight should have an LED lamp. This will ensure optimal battery life, optimal light quality and optimal effectiveness in defensive situations. 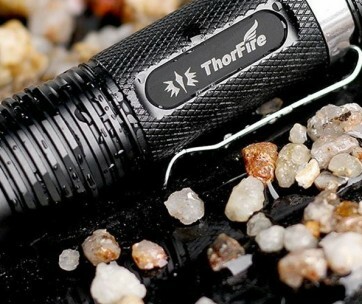 Durable – How tactically effective is a flashlight or any other device if it breaks under pressure? Not very. Therefore any real tactical flashlight will be made of aircraft-grade aluminum or something comparable. 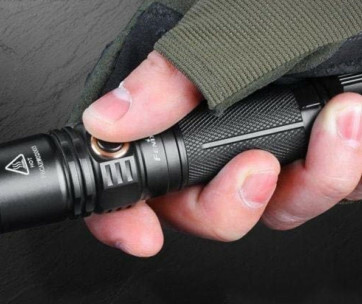 This gives the flashlight heft so when you strike with it the attacker feels it and also ensures that if you accidently drop it, it won’t crack or otherwise break. Waterproof – You have to assume that emergency situations aren’t going to happen under ideal conditions. Therefore it’s essential that any flashlight that wants to be considered tactical be waterproof. This is not open for debate. The flashlight must deliver regardless of the weather or it’s not truly tactical. Now that we know what to look for in a tactical flashlight let’s look at how best to use it and look after it. To Provide Blinding Light – Attackers need to be able to see you in order to hurt or rob you. This is where the tactical flashlight comes in. As the assailant approaches train the flashlight’s blinding light squarely into their eyes to disorient them. With your attacker temporarily blinded you’ll buy time to effect an escape, either back to your home, your campsite where your tent is, or if you’re in the wild, anywhere you can hide from your attacker. To Defend Yourself More Effectively – If, like most average people, you have limited self-defense skills you’ll benefit from having the tactical flashlight on hand to provide you an advantage should an encounter become physical. Simply hold the flashlight in an overhand fashion and strike down with it on the attacker’s skull, cheeks, jaw or throat. They’ll feel every ounce of the heavy aircraft-grade aluminum shaft as it impacts these sensitive areas. And if your tactical flashlight is designed with bezels around the head or end cap they’ll also feel their flesh being penetrated and torn away with every strike. A true tactical flashlight is an indispensable part of your everyday carry. Not only does it provide powerful light for a variety of practical applications it can also provide the life-sustaining difference in situations where you find yourself under assault either from the wrath of mother nature or some cowardly weasel with bad intentions. When you choose your tactical flashlight keep the above checklist with you and you’re sure to end up with one that will serve you proudly for years to come.